Geneva, September 25, 2018 -- STMicroelectronics’ STPW12 programmable electronic power breaker provides a convenient, integrated solution for quickly and safely disconnecting a faulty load from a 12V bus. Inserted between the power rail and the load, the STPW12 contains a low-resistance (50mΩ) power switch and precision circuitry for sensing the load power. If the user-programmed limit is exceeded, the switch turns off and a signal on the dedicated monitor/fault pin informs the host system. In normal operation, this output presents an analog voltage proportional to the load power to permit continuous monitoring. 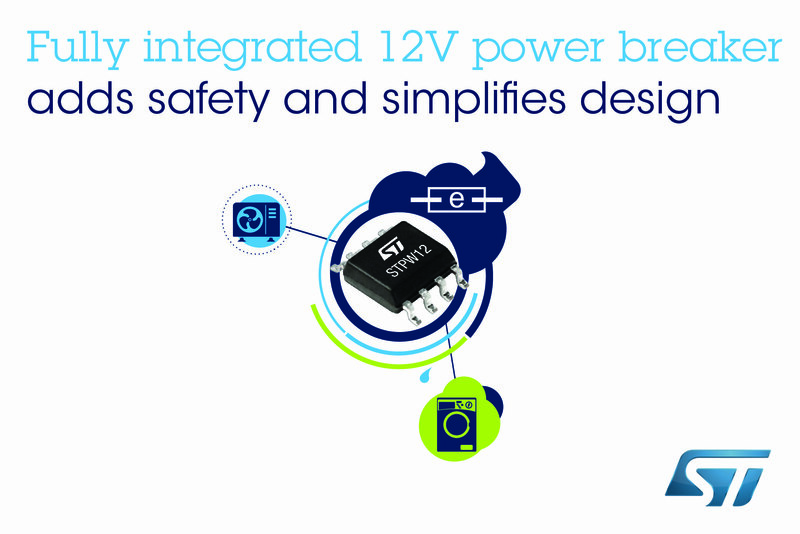 Also featuring built-in auto-restart after a user-adjustable delay, and programmable PWM masking time to prevent protection triggering by inrush current, the STPW12 simplifies design for safety and eases certification to standards such as the UL 60730 specifications for abnormal operation. This integrated solution effectively replaces discrete circuitry or a combination of ICs such as a current-sense amplifier or a hot-swap controller plus MOSFET switches, by offering improved accuracy and saving board space and bill of materials for each load protected. The power threshold and masking time are each easily programmed using a resistor. An external capacitor sets the auto-retry delay. With the addition of input and output capacitors, these are the only external components needed to complete the circuit. A direct PWM mode with programmable masking time to modulate the load energy allows flexibility to control the internal power switch with an external signal. A comprehensive set of protection features is provided, including Under-Voltage Lockout (UVLO), thermal shutdown, and short-circuit current limit. The STPW12 is in production now, packaged as a Power SO-8 device, priced from $ 0.95 for orders of 1000 pieces. Please visit www.st.com/stpw12-pr for further information.